Sylvan Dell publishing is allowing the public to view for FREE their new line of ebooks. These ebooks are animal-themed picture storybooks for children with beautiful illustrations and text. They can be used to learn language or science. The neat thing is, they are bilingual (English/Spanish). You can switch the language while you're reading one page and it'll stay on that page. Plus you can have the book read to you (audio) in either English or Spanish. Click, and then click the button that says "Validate access code". a parent center with yet more resources such as printable workbooks and videos.Mathletics is a subscription service, but it offers a lot! Please read my review and see screenshots. Most of us have seen the picture of Escher's paradoxical staircases - but today I saw a model of them built of Legos! Go see it - it's just cool! 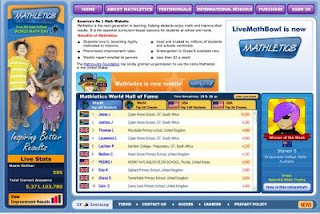 Go check out Math Teachers At Play blog carnival at Math Mama Writes. There are lots of enjoyable posts there - I'm still reading through! When I was a kid, my mom sometimes bought my brother and me activity books to fill up our summer time. Well, if you're into activity books, here's a Sticker Math Fun by Usborne that I can recommend for summer math learning and practice (grades K-2) (or for later in the school year as well, for that matter). It has different mathematically-sound activities for addition, subtraction, beginning multiplication, fractions and clock, mostly on about 1st grade level but some for kindergarten and some for 2nd. It is filled with quite variable and creative activities, and not just dull simple adding and subtracting. The activities include missing addends or subtrahends, number patterns, finding numbers that add up to a certain number, and so on. It is in full color with kid-friendly imagery. We bought this book several months ago, and I can say my kindergartner-1st grader has really enjoyed the book! And the third grader has wanted to do several pages as well.